#Win Lugz Grotto Boots for Her! 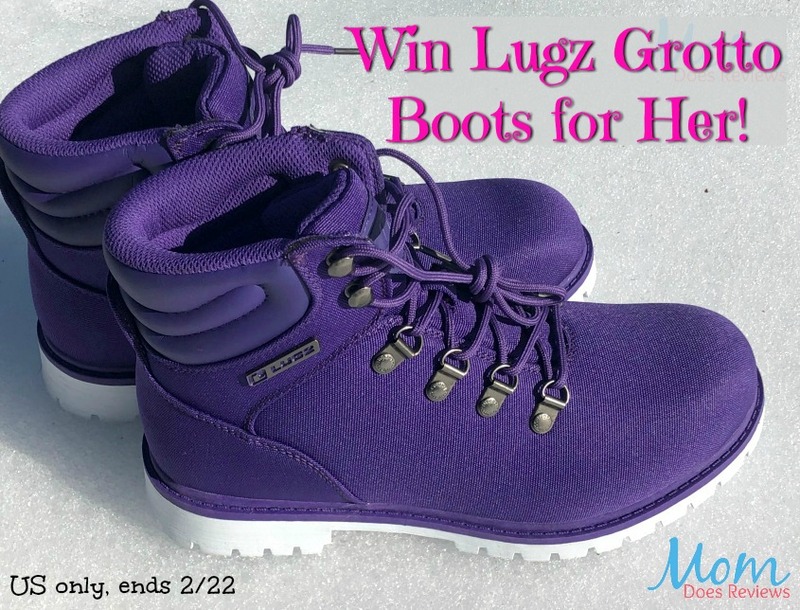 The great giveaway is sponsored by Lugz and hosted by Mom Does Reviews. Looking for a great gift idea? You can’t go wrong with Lugz! They have amazing styles, colors and fashions that anyone will love. Be sure to read Pam’s review on Mom Does Reviews here to see how much she likes her Grotto boots! One lucky reader will win their own pair of Grotto II 5-inch boots in the color of their choice. My wife would like the grey ones. I like the olive/brown lugz. They would match a lot of my clothing. I’d choose the blue, black, or brown boots. Mainly because they would go with most anything. The other colors are a little too bright for me. Thanks! I would choose black so I could wear them with multiple outfits. I absolutely LOVE the pink ones! I would choose those because I love pink and, well…it goes with everything! haha, good luck everyone! I would choose the red just for something fun and different to stand out in all this snow we have. My community has the highest snowfall total in the US right now. I’d choose the black because they would go with everything I own. Although, I really like the purple. I would choose the charcoal black ones. They would go with more of my wardrobe. I would pick the purple and white for my daughter because that is her favorite color, they are wild and she would love these! I would get the BLACK CHARCOAL TEXTILE color because it would match with most everything. I would definitely pick the pink. I don’t really have a fashion statement to make, except that I do like layering different shades of pink. It is a color that makes me happy! These boots look amazing. I need boots with better traction will all of the ice we have this year. Thanks for the super giveaway opportunity. I would get the red ones. I have always loved red shoes! I would choose the purple! Those are so cute and bright! I would choose the black boots because they can be paired with anything.